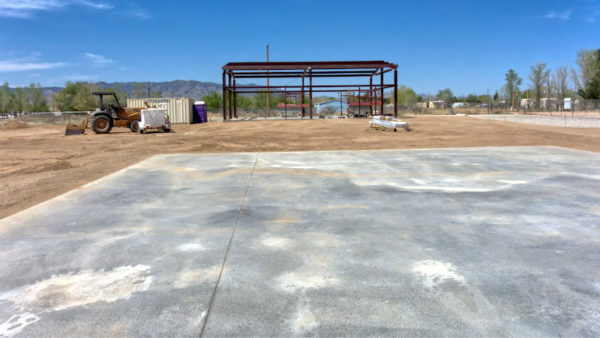 The new playground will be next to the community center building (background) In early April, 2018 the construction crew raised the frame for the building. The Vitalyst Health Foundation has awarded funding to SEAHEC that will provide playground equipment for the We “Heart” Children Burris Memorial Park, which will become the playground for the Winchester Community Center. SEAHEC is helping the community of Winchester Heights build a community center and playground to help the community gain the organizational capacity needed to improve local public health outcomes. In 2017, we helped local residents conduct a Community Environmental Health Assessment that enabled the community to identify, prioritize and plan to address public health concerns. The project utilized SEAHEC’s Healthy Farms community health worker (CHW) team to develop and distribute the survey. Later, the CHWs worked with SEAHEC public health interns to analyze the data, present it to the community and help residents prioritize goals and develop an action plan. Launched in Winchester Heights in 2013 to promote public health, the Healthy Farms CHW team has been working with neighbors to build knowledge and organizational capacity to address the community’s glaring public health infrastructure deficits. A safe place for children to play where they can be supervised when parents are working is a top goal of the neighborhood security priority. Thanks to the Vitalyst Health Foundation, we are one step closer to realizing that goal. Thank you, Vitalyst Health Foundation!